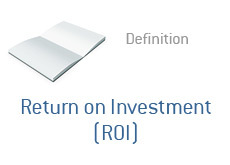 Return on Investment (ROI) - What Does It Mean? What does Return on Investment, or ROI, mean? What is the definition of Return on Investment? Will an investment (of any kind) yield positive returns? And if so, how much? To answer these questions, you need to calculate the ROI (Return on Investment). So, let's say that you invested $10,000 into a venture and ended up receiving $15,000 back (your initial $10,000 investment, plus $5,000 in profit). This would mean that you saw a ROI of 50%, which would be a "positive return on investment." Let's say that you ended up receiving just $7,500 of your original $10,000 investment back. This would mean that you saw a ROI of -25%, which would be a "negative return on investment". This is the simplest definition of the term "Return on Investment".